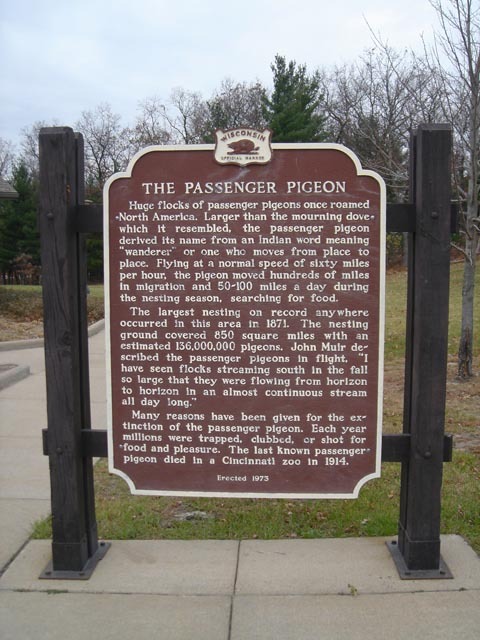 Located Rest area Westbound I-94 , approximately 5 miles west of Millston, WI Coordinates Lat N 44:14':833" Lon W -90:44':273"
Huge flocks of passenger pigeons once roamed -North America. Larger than the mourning dove-which it resembled, the passenger pigeon derived its name from an Indian word meaning "wanderer" or one who moves from place to place. Flying at a normal speed of sixty miles per hour, the pigeon moved hundreds of miles in migration and 50-100 miles a day during the nesting season, searching for food. The largest nesting on record anywhere occurred in this area in 1871. The nesting ground covered 850 square miles with an estimated 136,000,000 pigeons. John Muir described the passenger pigeons in flight, "I have seen flocks streaming south in the fall so large that they were flowing from horizon to horizon in an almost continuous stream all day long." Many reasons have been given for the extinction of the passenger pigeon. Each year millions were trapped, clubbed, or shot for -food and pleasure. The last known passenger-pigeon died in a Cincinnati zoo in 1914.